Manpreet Alag‘s recent post, SPWebConfigModification does not work on Farms with multiple WFEs, has been making its rounds on Twitter and the link blogs. A post title like that is sure to get attention, but is it really true? After looking a bit closer, I don’t believe it is. Instead of adding modifications to WebConfigModifcations of SPWebApplication object, we are using SPWebService.ContentService to call ADD and UPDATE methods. Whenever required, it is always advised to use SPWebService.ContentService to make the modifications rather than accessing Farm instance through SPWebApplication. The modified sample isn’t actually doing anything different to apply the changes! So the problem is either in how SharePoint handles Web Application-scoped web config changes, or that the changes aren’t being applied correctly. The latter is much more likely than the former, and indeed the solution is actually quite simple: just look for the only other significant difference between the code samples. A quick PowerShell session or console app would have verified that the config changes weren’t being saved to the database. Always call Update() after making changes to an SPPersistedObject (like SPWebApplication or SPWebService). SPWebService.ContentService is a shortcut for SPFarm.Local.Services.GetValue<SPWebService>. Check your code carefully before blaming the SharePoint API! PowerShellASP was announced earlier this week, and naturally my first thought was “Does it work with SharePoint?” It turns out that it does, but only for paths mapped to the file system (_layouts, _admin, etc). I’m hoping the authors will consider making a SharePoint extension of the handler to support files stored in the content database as well (more on that later). Just think…writing PowerShell in SharePoint Designer! What could be better?! Of course you could just follow the provided installation instructions by hand, but what if we wanted to use a WSP? PowerShell is included on Windows Server 2008; for other flavors of Windows, download here. This contrived example fetches the current SPSite and SPWeb and then outputs a table of the hidden lists in the current site with a few properties. 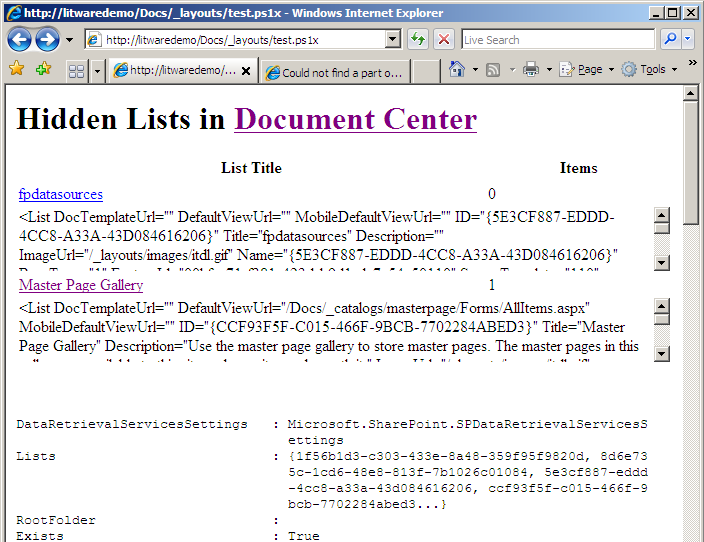 It also dumps the default PowerShell view of the current SPWeb, SPSite and HttpRequest objects. It’s not exactly pretty, but it sufficiently demonstrates a few key concepts of PoShASP. Since Docs/Documents/Get-Process.ps1x doesn’t map to anything special like _layouts, IIS just maps it to the local root of the site. We know this won’t work, but how can we let the handler in on our little secret? In my next post I’ll go over some code that could get us to that point. With or without the content database limitation, how would you use PowerShellASP with SharePoint?